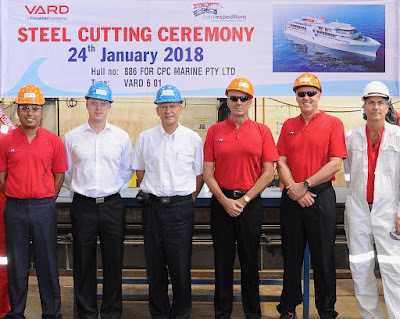 On Wednesday 24th January 2019 (UTC), Coral Expeditions, together with Vard shipyard, achieved the exciting milestone of the first steel cutting ceremony for its 120 passenger newbuild expedition ship, the Coral Adventurer. After a year of planning and engineering design, Coral Expeditions' custom-build ship has started to become a reality. The fourth vessel in the Australian-flagged fleet, the Coral Adventurer's design draws on the latest technical advances as well as the company's 34 years of experience building and operating expedition ships. Paul Chacko, Coral Expedition's Executive Director, in the presence of Mark Fifield, Group GM, Gary Wilson, Senior Master; and Frank Krone, Newbuild Manager, took to the reins of the laser cutter and initiated the cutting of the first steel of Coral Adventurer. The steel cutting ceremony proceeded a week ahead of schedule, showing signs that the build is off to a great start. The Coral Adventurer has received a rousing reception from Coral Expeditions' loyal clientele, with the maiden 18-night voyage in April 2019 nearly sold out. This voyage is part of a series of two themed itineraries called "In the trail of Tasman" exploring lesser-known islands in Indonesia and West Papua visited by explorer Abel Tasman three centuries ago. In May 2019, the Coral Adventurer assumes duties in the Kimberley region, where Coral Expeditions is operating in its 24th year. The itineraries are designed to showcase Coral Adventurer's expedition capabilities taking guests to remote areas inaccessible to larger or less capable vessels. Amongst the noteworthy features of the Coral Adventurer are highly flexible customised tenders mounted on an aft platform for rapid deployment for excursions, facilities for hosting research missions onboard, a guest observation lounge on the bridge, and a relaxed interior featuring Australian colours and materials by design firm Arkhefield. 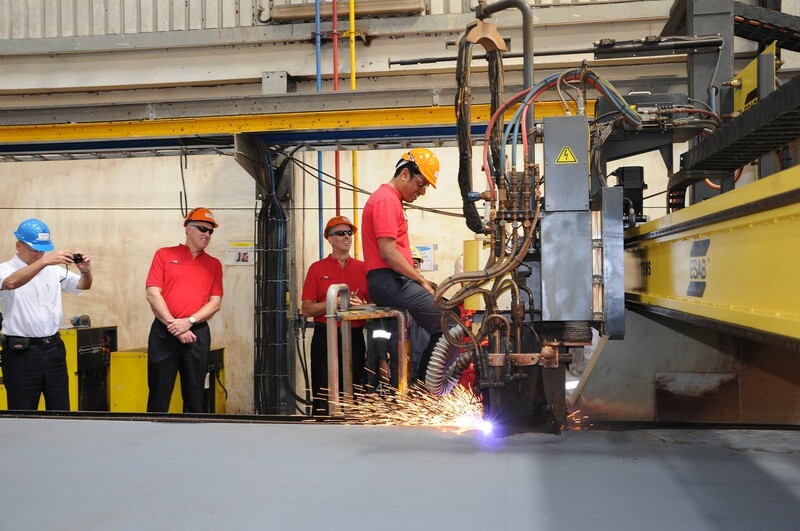 The ceremonial first cut of steel for Coral Expeditions' newbuild Coral Adventurer by Paul Chacko, Executive Director; in attendance are Mark Fifield, Group General Manager, and Gary Wilson, Senior Master.